So, as I unravelled my beautiful oak solver of shoe-related problems, my son impatiently jumped up and down waiting for the box. His sister then caught on and was just as impatient, standing ready with pens to colour it in. 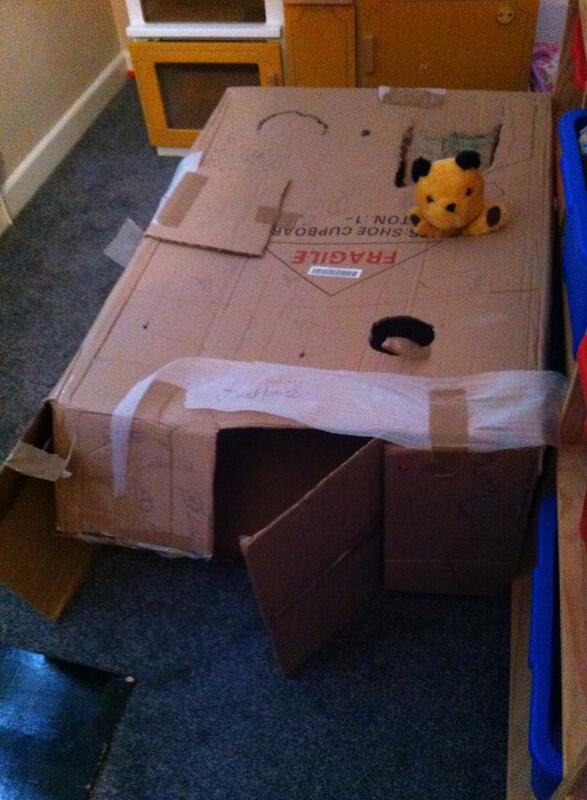 For once, they worked well together in creating a den of sorts, with lots of peep holes for Sooty and friends. It was a joy to behold such camaraderie, though this was short-lived when they realised that it was a real squash to both go in at the same time. Cue more half-term squabbles and the suggestion of a box rota! So, I bet you all know what I mean when I say that kids really do prefer the box to the contents, even at age 8. I wonder how long I have before this fabulously simple and creative little bit of fun becomes less interesting. I hope I have years to come as I love it!